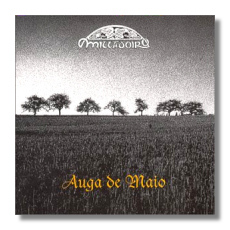 Classical Net Review - Milladoiro - "Auga de Maio"
Milladoiro, a septet of traditional musicians from Galicia, which is a Celtic province in northwest Spain, celebrates 20 years together by releasing its 12th album, the outstanding "Auga de Maio," in July 2000. This merry collection blends more musical styles and instruments than you can shake a stick at. The sound of something entirely new results, with allegiance to Irish, klezmer, Spanish, medieval, Middle Eastern, French chanson and many other influences. Musicians here play everything from harp to ocarina. A partial list also includes guitar, hurdy gurdy, bouzouki, violin, flutes, bodhran (an Irish goatskin drum), keyboard, tambourine and two types of small bagpipes, the gaita (from Galicia) and the uilleann (from Ireland). Always mellow, spacious and laid back, this intoxicating music often develops characteristic dance rhythms, like jig, jota, bransle and polka. Delightful, delicate, deft, classically virtuosic and totally different, this engaging CD also includes a few ardent songs in Spanish Gaelic.